A Firewall is the first line of defence against both, the inbound and the outbound threats. Firewalls can protect against threats that your Antivirus may miss. Windows has an inbuilt Firewall since the release of Windows XP in 2001. It did provide basic protection but was not very configurable. With Windows Vista, Microsoft released a much better and configurable firewall built on their Windows Filtering Platform (WFP) technology. The Windows Filtering Platform (WFP) is an API toolkit provided by Microsoft that can be used by companies to create network filtering products for Windows systems. 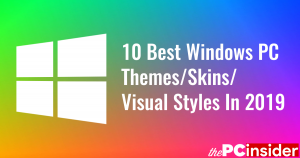 Since Windows Vista, the Windows Firewall component included in all of the Microsoft operating systems is based on the Windows Filtering Platform technology. Most of the software that Microsoft ships with Windows are not the best in their field. They only have the basic settings. But that is not the case with Windows Firewall. It is a very competent program. However, if you want something with a more user-friendly interface then you need to look at the third-party firewall software. Comodo Free Firewall is known for providing a strong multi-layer protection for Windows PCs against all kinds of threats. Even if you are happy with Windows Firewall, you can use Comodo only for the additional tools that it provides along with the main firewall component such as Sandbox, HIPS, File Rating, etc. 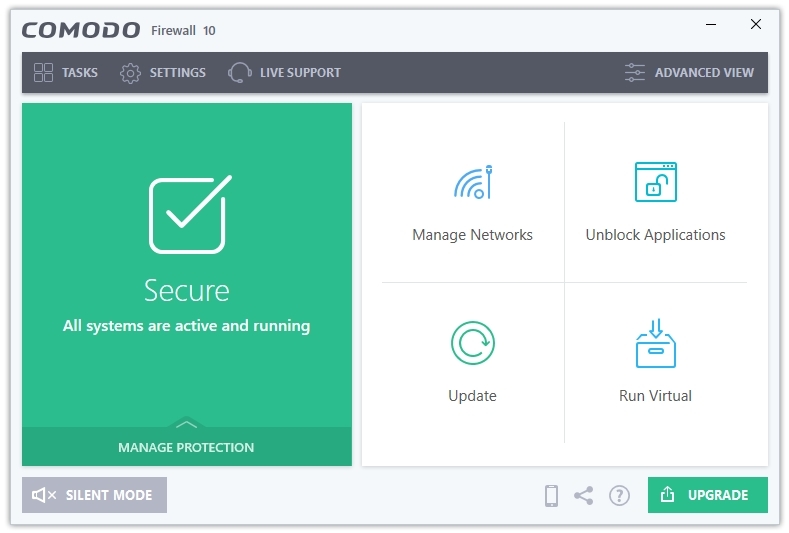 In Comodo Free Firewall, along with the Firewall and Website Filtering technologies, you get many other security components that provide a strong protection to your computer, these components are – VirusScope Behaviour Blocker, Defense+ HIPS, Sandbox Virtualization, File Rating Cloud Protection, and Comodo Secure DNS. All of the features are categorised in four sections – General Tasks, Firewall Tasks, Containment Tasks, and Advanced Tasks. 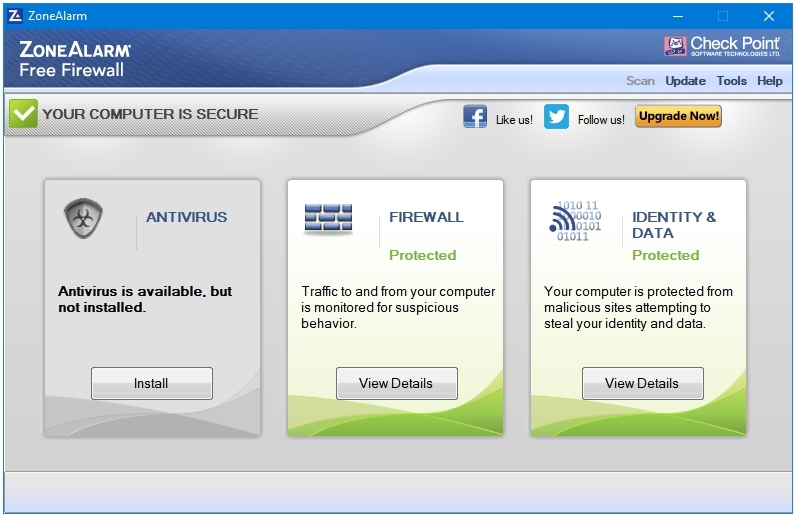 Additional computer security tools such as Comodo Rescue Disk Creator, Comodo Cleaning Essentials, and Rating Scan are also included. Another nice feature is the password protection that protects Comodo and its settings from malicious programs that try to disable the security software installed the computer. Four themes are available that you can use to customize Comodo. It does include some third-party services in its installer that make changes to the default configurations of your web browsers. Make sure you clear those checkboxes while installing Comodo. ZoneAlarm Free Firewall is the oldest, the most popular, and the most downloaded free firewall software available for Windows. ZoneAlarm protects your computer against threats by using their technologies in the following three sections – Firewall, Application Control, and Identity and Data. The Firewall section handles the inbound protection of your computer or the traffic coming from the Internet to your computer. It filters the traffic automatically to protect your computer from system invasions and hacker attacks. You can change the Firewall security level by changing the Public Zone and Trusted Zone settings. The Application Control section handles the outbound protection of your computer or the connections made from programs on your computer to the Internet. ZoneAlarm automatically manages this section. However, you can create your own rules and policies as well. ZoneAlarm uses their two technologies called Network firewall and DefenseNet to make feature this work. The Identity & Data section protects your important data through their feature called myVault, which lets you securely store your important text data such as Passwords, Bank Account Numbers, Social Security Numbers, etc. Another feature called Trusted Sites lets you manually add websites that you consider safe, and do not want ZoneAlarm to block. During installation, it tries to set Yahoo as the default search, homepage, and new tab page of your web browsers. Occasionally, you see ads of their paid products. 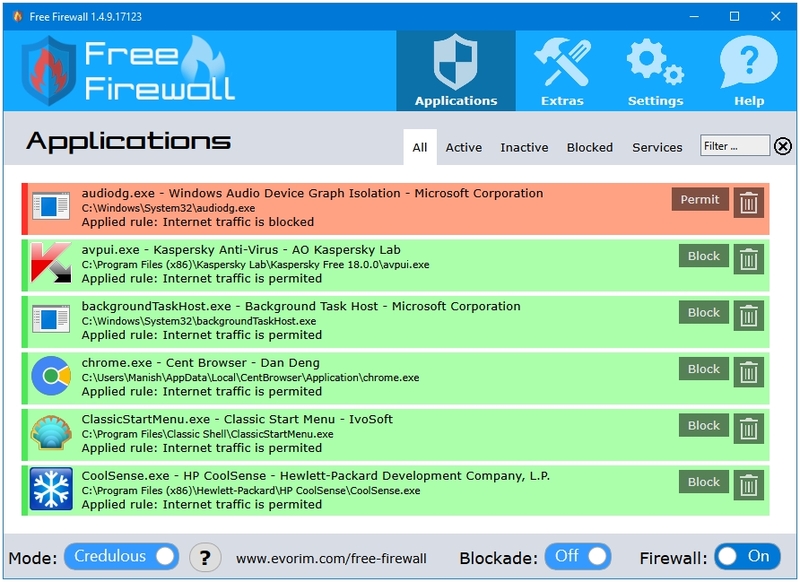 Evorim Free Firewall is a lightweight and full-featured firewall software that can also work alongside the Windows Defender Firewall to provide you with a much better protection from harmful programs and malicious websites. Evorim imports all of the installed processes and services on your computer, and then categories them into various groups such as Active and Inactive. It uses a unique concept of colour codes to differentiate between different types and groups of programs and services. It works in two modes – Credulous and Paranoid. In the Credulous Mode, all of the applications for whom the user has not set any rules, are permitted to connect to the Internet. In the Paranoid Mode, all of the applications for whom the user has not set any rules, are blocked from connecting to the Internet. There is another option called Blockade, which completely disabled the internet connection on the computer when enabled. Evorim Free Firewall does not have a pro or paid version, so you do not get any banner and buttons asking you to Upgrade to the premium security. A clean looking program overall. 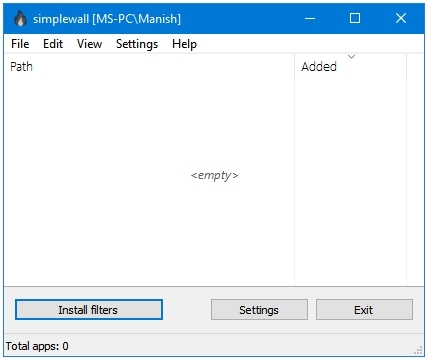 simplewall is a simple, lightweight, and straightforward rule-based firewall software for Windows PCs. It works on top of the Windows Filtering Platform (WFP). It is available in the Portable mode as well. It’s not a real-time monitoring firewall software. Instead, it is a rule-based Windows Firewall fronted. Because it does not support the real-time monitoring of processes, you do not be get the HIPS type popups and alerts from this firewall about programs trying to connect to the Internet. It works with the help of a Blocklist and Rules. The developer has his own Blocklist that blocks the Windows Telemetry from connecting to the Internet, and sharing data with Microsoft. It has predefined System rules for various applications. There is support for Custom rules as well through the Rules editor feature. Two types of rules can be created – Global and Special. The Global rules are applied to all of the apps whereas the Special rules are applied to the specific manually selected apps. You can create your own rules for the various programs, and set actions like Allow or Block in either of the directions, Inbound or Outbound. The Rule editor lets you specify Network Protocols and Ports as well. These Custom rules can be used along with the System rules. simplewall is a free and open source software that comes without any ads, promotions, or bundled services. Windows Firewall Control extends the functionality of the Windows Defender Firewall by acting on top of it. Windows Firewall Control is a much more usable, user-friendly, and feature-rich version of the Windows Defender Firewall. It lets the user have more control over the processes and services that connect to the Internet. 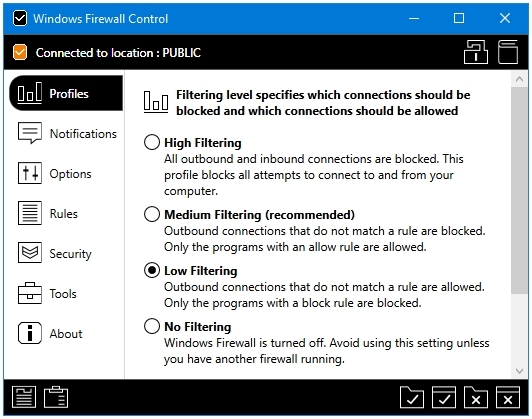 Windows Firewall Control lets its users configure the Firewall-related settings in the following three sections – Profiles, Rules, and Security. Under the Profiles section, four filtering modes are available – High Filtering, Medium Filtering, Low Filtering, and No Filtering. Filtering is the sensitivity level of the Firewall. The next important section is Rules, which lets you configure settings for both, the Outbound and the Inbound connections. You can Import or Export the Windows Firewall rules, or reset them to their defaults. The Security section gives you some advanced security settings such as Secure Boot, Secure Rules, and Secure Profile. You can create your own rules for specific programs. These rules can be locked by password protecting the program. Windows Firewall Control is great for people who want the security and feel of a firewall software but don’t want the impact that these software can have on their systems due to their continuous monitoring of processes and network traffic. Windows Firewall Control runs only the essential services and processes, hence does not affect the system performance. There are no ads or third-party PUPs bundled in the installer. The program interface does not show any promotions or ads. Other Free Firewall Software that were Used and Tested but are Not Recommended or Included in the List. Privatefirewall – Not updated in the last 5 years. TinyWall – Not updated in the last 2 years. SterJo NetStalker – Not updated in the last 2 years. Windows Firewall Notifier – Could not make into the Top 5. GlassWire – The Firewall features have been removed from the Free version starting version 2.